Today Google announced that the Google+ comments will now be integrated with Blogger, which will aim to give a more social experience with comments, and better integrate its social network with its own services. Currently, Blogger uses a rather old comment system. It isn't really feature rich, and isn't exactly as simple to use either (like having to reload the page to submit a comment, for example). However, there are third party alternatives out there, such as Disqus, which is used here. Those that use Google+ and want to integrate it with Blogger even farther than sharing will now be able to replace the default Blogger embed with a Google+ comment embed. People who post comments can choose to share their posts to Google+ as well, either publicly or with their selected circles. You can also choose not to share to Google+, and instead just post a comment on a page like normal. What's also special about this integration is shares of a post on Google+ will also appear in the comment embed. For example, the source post about this news from Blogger Buzz uses the Google+ embed, and you can see shares from a few of the Google affiliated accounts. Like normal, you can choose to reply and +1 a comment if you desire. When hovering over a comment, the top right corner of a comment will reveal a drop down where additional options can be found. 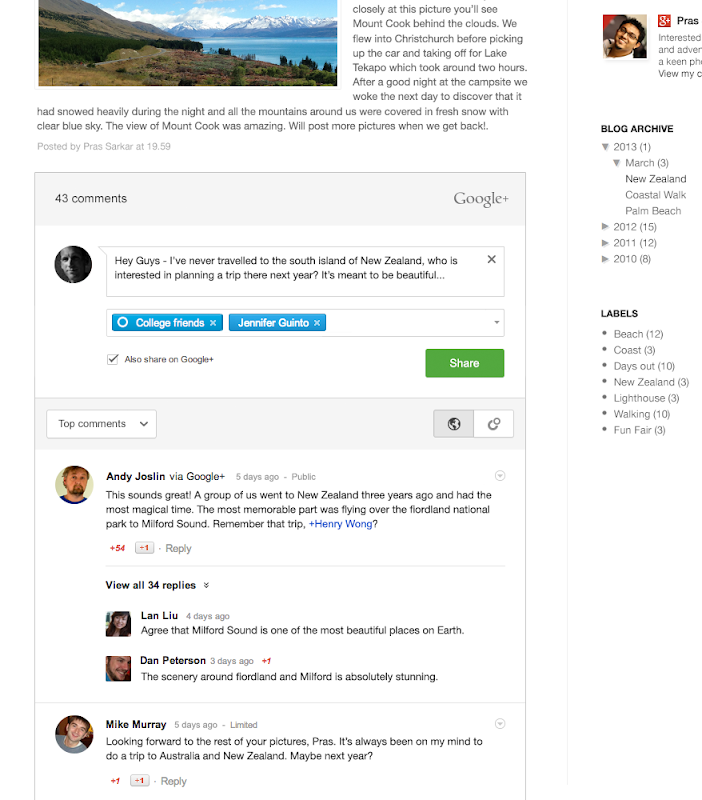 Comments from the old Blogger system are not lost, and will appear in the Google+ comment system as well. However, I'm not sure if Google+ comments will go back into the old system if you decide to revert back. To enable Google+ comments, go to your Blogger Dashboard, click the drop down arrow for a blog, and go to the Google+ settings area. On the right you'll see a check box to enable Google+ comments.